Mark Petticrew is an associate director of the MRC Social and Public Health Sciences Unit at the University of Glasgow, Co-ordinator of the ESRC Centre for Evidence-Based Public Health Policy, and has written widely on systematic reviews. Helen Roberts is a social scientist, and professor of Child Health at City University, where she leads the Child Health Research and Policy Unit. Until 2001 she was Head of R&D at Barnardos. Her most recent book is What Works for Children (ed) with Di McNeish and Tony Newman. 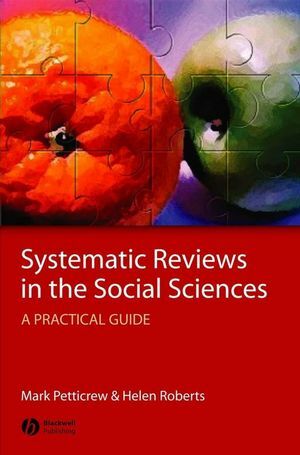 Chapter 1: Why do we need systematic reviews? Chapter 2: Starting the review: Refining the question and defining the boundaries. Chapter 3: What sorts of studies do I include in the review? Deciding on the review's inclusion / exclusion criteria. Chapter 4: How to find the studies: The literature search. Chapter 5: How to appraise the studies: An introduction to assessing study quality. Chapter 6: Synthesising the evidence. Chapter 7: Exploring heterogeneity and publication bias. Chapter 8: Disseminating the review. Chapter 9: Systematic reviews: Urban myths and fairy tales. Appendix 1: The review process (and some questions to ask before starting a review). Appendix 3: Example of flow diagram from a systematic review. Appendix 4: Example data extraction form. Appendix 5: Variations in the quality of systematic reviews.